Chinese design firm Hallucinate created a futuristic office for Maike Group, one of the country’s top suppliers and traders of metal. 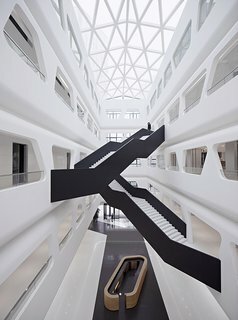 Stark, angular staircases traverse the building’s sleek white interior. 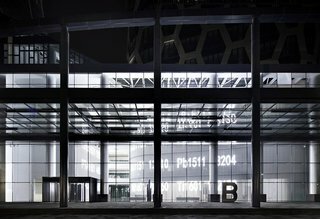 Located in Xi’an’s International Port District, the building pays tribute to the region’s command over trade and industry in its clean, hypermodern design, taking the storied history of Xi’an as a departure point for innovation and advancement. The interior walls take on the texture of vertical grating and horizontal ridges as though charting the aerodynamic contours of enterprise. 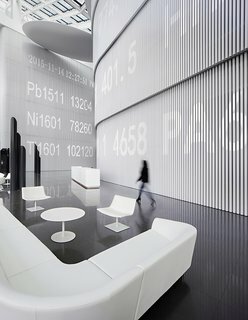 The curved walls that greet visitors at the entrance also display illuminated data points, blurring the distinction between technology and materiality. A ticker runs along the wall, superimposing digitally the work done in physical space. The Xi’an International Port District is a hub of manufacturing, research and development, transportation, and other industries. To see more projects by Hallucinate, visit them online.